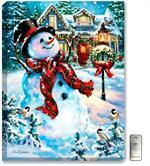 Illuminated Christmas themed wall art. 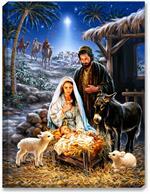 Mary, Joseph, baby Jesus in manger. 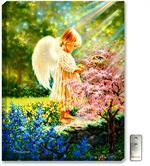 A brightly light painting of a little girl angel, with sunlight, lilacs, and blue bells in a forest. 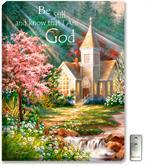 Illuminated wall art by Dona Gelsinger. Features a festive Snowman, complete with tartan plaid scarf, black top hat, and buttons made out of coal. Blue traditional farmhouse with Christmas lights sits in the background. 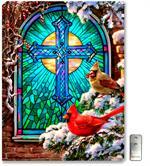 Bright cardinal birds sit on a evergreen bough covered in snow. Stained glass cross sets behind them in blues, greens, and teals. A bright and jolly Santa Claus is posed with his list of naughty and nice, and he's checking it twice. 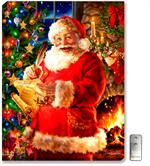 Background has an elegant and colorful Christmas tree, and Santa is standing in front of a warm, crackling stone fireplace. 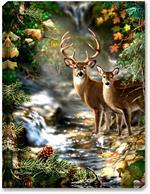 A fall 4 point buck stands along side his doe, in front of a mountain creek, with fall foliage and leaves. 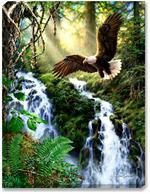 A majestic American Bald Eagle soars above a sunlight mountain or hillside waterfall and creek. Ferns, moss, and evergreens add a brilliant green backdrop to the eagle. 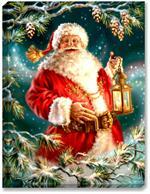 A cheerful and jolly Old Saint Nicholas is all dressed in red, with a big smile, holding a golden candle lite lantern, with snow, stars, and pine cones in the background. A large spotted bass leaps out of the mountainside creek to catch a dragonfly. A tiny log cabin sits in the background, complete with red canoe, stone fireplace, lantern, and campfire. The mountains behind the cabin are filled with lush evergreen trees. 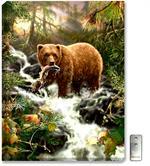 A large Grizzly bear catches a rainbow trout while standing in a mountainside creek. Evergreen trees are basked in the sunlight. 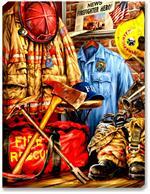 A firefighter's gear: turnout gear, helmet, boots, mask with respirator, duffel bag, axe, and pick. A 1950s black and white police car is parked on main street, in front of City Hall and Main Street Deli. 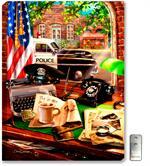 Inside the police station sits a black hat, classic typewriter, rotary telephone, and case files. In vino veritas is a Latin phrase that means "in wine, truth", suggesting a person under the influence of alcohol is more likely to speak their hidden thoughts and desires. This painting features red and white wine, grapes, and a Tuscan villa. Santa is caught napping, fast asleep in his rocking chair. A tabby cat sits on his lap, while Santa rests besides his crackling stone fireplace and brightly decorated Christmas tree. A warm cup of cocoa sits on the table with some cookies. 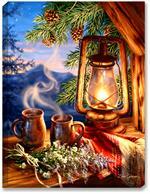 Two mugs of morning coffee sit, overlooking the Mountain sunrise (with stars still in the sky), complete with a lantern, woven blanket, log cabin window sill, pine cones and evergreen boughs, and freshly picked wildflowers. 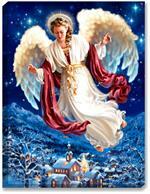 An elegant angel soars above a winter mountain side town scene. Brilliant sapphire blue night sky with stars above. Town features snow capped buildings, and a church with steeple. 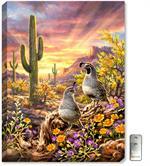 A warm and appealing painting of desert quail, with sunset colors, desert wildflowers, cactus, and large rock formations. Three shepherds tend to their flock of sheep and lambs, while overhead the bright star of Bethlehem guides them. Four angel children, dressed in white, decorate a Christmas tree. Peace doves fly overhead a snowy, winter scene. A welcoming Snowman, dressed in a gentleman's black top hat, and knit red scarf is complete with carrot nose and eyes made out of coal. 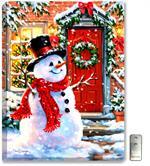 The Snowman brings holiday cheer to visitors of the brick house with large red front door. 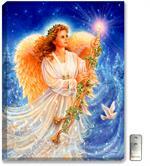 A beautiful young angel holds a golden candlestick. A peace dove softly flies by. Brilliant sapphire blue background with stars and snow dusted evergreen trees. 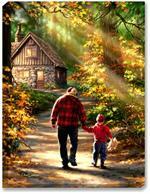 Father and toddler son walk the driveway to a log cabin in the woods. 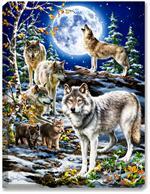 The Spirit of the Pack features a pack of wolves, complete with wolf pups, snow covered ground, and a full moon. A warm and rustic art print featuring wine bottles of Cabernet Sauvignon, Pino Gregio, Sparkling Wine, Merlot, and Chardonnay. A map of Tuscany acts as a backdrop, while clusters of grapes and corks add depth and whimsy to this print. 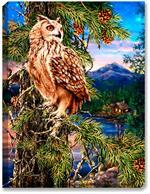 A majestic owl sits perched high in an pine tree. 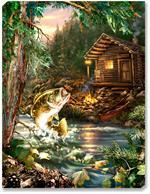 His view includes a snow peaked mountain, trees, log cabin in the woods, and a tranquil lake.